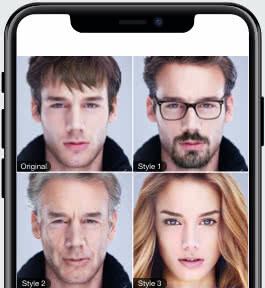 Not only is FaceApp a state of the art photo-editor powered by AI, but also an app that has over 80 million active users. FaceApp is a free app that can be downloaded to your device from the AppStore or Google Play. Currently there are 21 fun&free filters in the basic version. The Pro version includes 28 filters that can change your style completely with just one tap. There is also a 3-days free trial period for you to enjoy all the premium-features before purchasing the Pro Version. © 2018 FaceApp. All Rights Reserved.